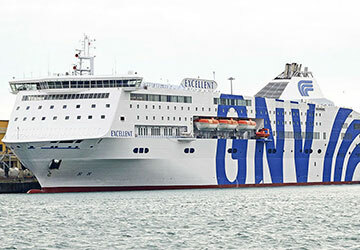 GNV’s Excellent can carry up to 2,230 passengers and 760 vehicles during its crossings, reaching speeds of 21 knots in the process. The ship has a huge number of facilities and attractions to provide travellers with an enjoyable sailing experience. There is a variety of different eateries to suit everyone’s culinary tastes, as well as a duty free shopping centre, games rooms, children’s area, swimming pool, libraries and a conference centre. 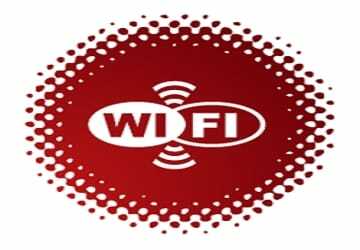 Wi-Fi is available onboard, so you don’t need to lose contact with anyone whilst making your voyage. 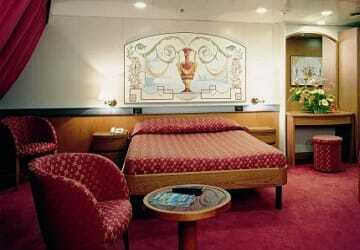 There are 387 cabins on the ship with specially designed accommodation for passengers with restricted mobility. For those who choose to travel with Grandi Navi Veloci, 387 cabins and 38 luxury suites are available for you to stay in. This comfy accommodation option provides the ideal setting for you to put your feet up, get some sleep and relax whilst making the smooth sailing. All cabins come with air conditioning and are equipped with an en suite bathroom, including a shower and hairdryer. The spacious and sumptuous suites also include air conditioning as well as a television, radio and mini bar and a large porthole to admire the crystalline sea views. This ferry has an extensive selection of food and drink options, with an a la carte restaurant, self-service food area and a fully stocked snack bar. The a la carte selection serves up choices for all three courses, with a mix of Mediterranean cuisine, regional foods and international flavours. The self service area contains a fast and informal restaurant setting, with extensive choices to suit all. The snack bar serves up breakfast, lunch, dinner and that something small in between if you are feeling peckish. This includes a variety of meal options and sandwiches, fruit salads and ice creams, just to name a few. GNV’s designated retail outlets offer you the option of treating yourself to clothing, cosmetics, perfumes and kids toys from their well-stocked shopping area. The usual newspapers, snacks, books, cigarettes and souvenirs are also available to buy. So whether you need something to help while away the hours, treat yourself, or buy holiday gifts, Excellent has you covered. The ship contains a Games Room where you can play the newest video games on the market or even try your luck on the slot machines. If you are going away on business, there is no need for you and your colleagues to fall behind on work as the ship is equipped with a conference centre and a number of meeting rooms. Make sure you pack your trunks and swimming costumes because in the summer months a swimming pool is available. On the vessel you’ll also find a library and chapel. A designated Children’s Area can be found on the Excellent so you won’t have any issue in keeping your little ones occupied during the trip. There are four disabled cabins onboard and the ferry is adapted for travellers with disabilities and restricted mobility. 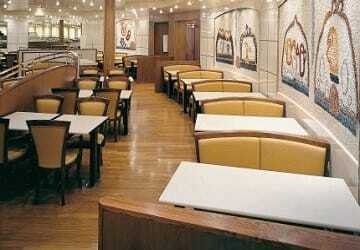 The ship caters for differently abled travellers throughout. Please Note: Whilst we have taken great care in making our Excellent guide as accurate as possible, onboard facilities, services and entertainment may vary depending on the date and time of year that you travel, facilities mentioned may change without notification and ferry companies reserve the right to operate vessels other than those mentioned at time of booking without prior notification. "Pleasant and calm boat trip"
It was hard to fins the correct ferry terminal because there were several and not clear signs. When onboard we got a nice welcoming from the cabin staff. Check in was very organised. The 4 berth inside cabin was normal sized and the bathroom was clean and neat. "Good service but negative post sales"
In conclusion the journey on board it was more than satisfied. All the attempts to contact the customer service (by phone or email) failed. We booked three month in advance and we realised we paid so much more than the price that was offered after. Good journey, beautiful esternal cabin, Only tv missing. We have used Grandi Navi Veloci many times over the years. The ship we travel on this time, the EXCELLENT proved very good. We had a good size suite with a comfortable double bed. The facilities on board ship were excellent. Staff were helpful and friendly. The choice of dining facilities were very good. The Bentley car was well parked with excellent guidance from the garage crew. A company to be highly recommended. Nothing to say about the organization, but there was uncomfortable because of the rough sea. I will recommend a friend to check before the wethear before booking. Excellent journey, calm sea and quiet crossing. 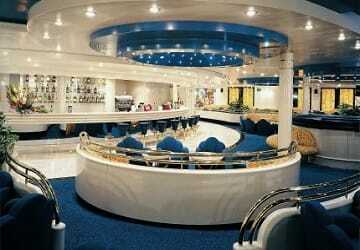 Good bar service, a lot of choises ath the self service. There was a piano bar at night, not very good, a cinema, and a club.